90 days. Capsicum annuum. Open Pollinated. 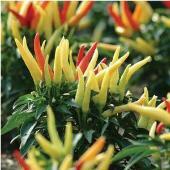 Plant produces heavy yields of ½" long by ¼" wide hot peppers. 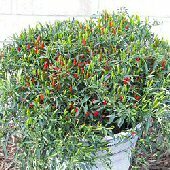 Peppers are very hot, grow upright, and turn from green to red when mature. Plant has green leaves, green stems and white flowers. Excellent drying pepper. 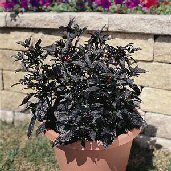 Perfect for containers, pots, patios, and small gardens. A variety from China. Certified Organic.